Start Anywhere and Don’t Stop. 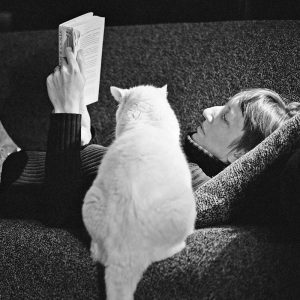 A Reading and Social with author Joëlle Anthony. She will kick off the evening with a presentation, sharing excerpts from her award winning fiction for kids and teens, telling stories, and answering questions. And when she’s finished talking, she wants to get to know you, and what you’re writing or reading, so please plan to stay for a social. Periodically, Joëlle hosts “socials” on her island, inviting anyone interested in writing or reading to come and hang out with others of the same ilk, have a snack, talk shop or just passions. Joëlle will also be teaching a Writing With Sensory Details workshop on Saturday March 30th. You can learn more and sign up here. Joëlle Anthony / J. M. Kelly is a writer, actress and playwright, born in Portland, Oregon, now living on Gabriola Island in BC. 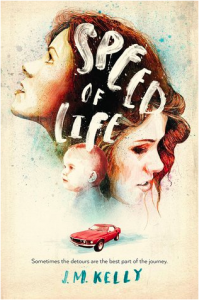 Speed of Life is Joëlle’s third novel, a White Pine nominee, hailed by Publisher’s Weekly as: a believable portrait of blue-collar teens struggling to make it work against tough odds. 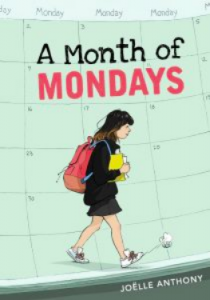 She’s the author of the 2017 Middle Grade novel, A Month of Mondays, an OLA Forest Kid Committee Summer Reading List pick, a VOYA Top Shelf Awardwinner, and a 2019Chocolate Lily Nominee. Her two previous novels for teens include Restoring Harmony and The Right & the Real. She is currently finishing her first book for adults, an historical novel set in 1962 Vancouver, called Between Over and Next. 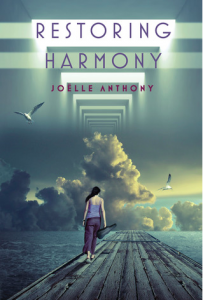 Follow her on Twitter at: joellewrites or visit her website: www.joelleanthony.com. Learn more about the Self-Directed Artist-in-Residence program here.